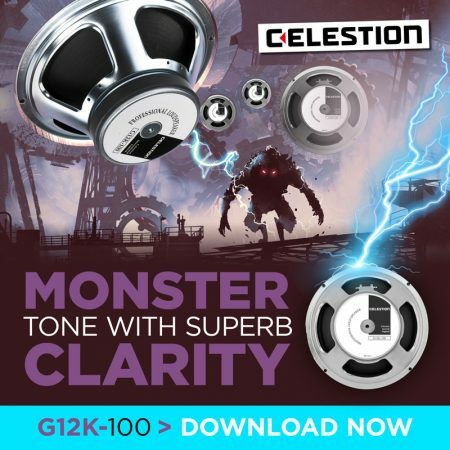 Celestion G12K-100 Speaker IR – Monster Tone Awaits You! The Celestion G12K-100 – also known as the Celestion K100 – is regarded by many as our ‘Monster of Rock’. And if you’re familiar with our speaker range you’ll know that’s up against some pretty stiff competition! So, we’re excited to announce that the distinctive, beefy tones of the G12K-100 are available to you now as an impulse response. So let’s delve into the tone of the G12K-100 and consider where our latest impulse response might fit into your Celestion speaker IR collection. The Celestion G12K-100 was born in the ’80s, when rock and heavy metal guitarists were looking for ever more power and heft from their speakers. We were happy to oblige with our first ever 100 Watt guitar speaker, created by bringing together a G12T-75 with our heaviest ceramic magnet. The result was a modern speaker which retained all the clarity and control of the T75, but with the addition of a tighter low end and a more relaxed treble. It adds up to a very powerful, full-bodied tone with a gritty, industrial feel in all the right places, especially on heavy, distorted playing, perfect for contemporary rock and metal genres. But the G12K-100 isn’t just about the heavy stuff – it delivers great tone right across the frequency spectrum and often finds use in small boutique combos bringing warm, melodic clean tones, with tons of midrange character, and plenty of articulation for fast, accurate country picking. The Celestion G12K-100 speaker IR has been sampled in 5 different cabinet configurations: a 1×12 open back, 1×12 closed back, 2×12 open back, 2×12 closed back and 4×12 closed back. The sound from each cabinet has been captured using three microphones widely used in the music industry – a Royer R-121, a Sennheiser MD421 and a Shure SM57. Each mic has been placed in six different locations – with an additional rear location for the open back cabinets. Each cab has also been sampled using a Neumann TLM 107 room mic, which can be used on its own or mixed with any other microphone to help create a fuller sound as required. If you’re looking for traditional high gain sound, using the K100 4×12 cabinet IR will likely be your obvious choice if you just want to get great, heavy tone. Choose the Dark or Dark2 mic positions to maximise the low end or, if you’re using them in a mix with other guitars, you might want to try out the Thin or Bright options to help it cut through a little better. Vintage 30 – In the analogue world, combining V30’s and K100’s in the same cabinet is a very popular option. The K100’s helps to thicken out the bottom end and add some grit, while the V30’s contribute their warmer vintage tone. G12T-75 – Cut from the same cloth, the T75 and K100 are going to give you a subtly different tonal twist while keeping things tight and modern. Greenback – Rated at 25W, it’s rare to find these in the same cabinet as the 100W G12K. But if you love Greenback tone and want something heavier, mixing in some K100 could be just what you need. Discover the tones of the G12K-100 for yourself and download the new G12K-100 Speaker IR here. Buy the 5 cabinet collection for a significant discount. Or create your own bespoke selection of speakers and cabinets from our range, with a Pick and Mix collection. Adam Steel tests out the G12K-100 in a range of playing styles including rhythm, rhythm + lead, single string, solo and quad tracking.